The Aquarius rescue ship last month as it entered the harbor of Senglea, Malta. 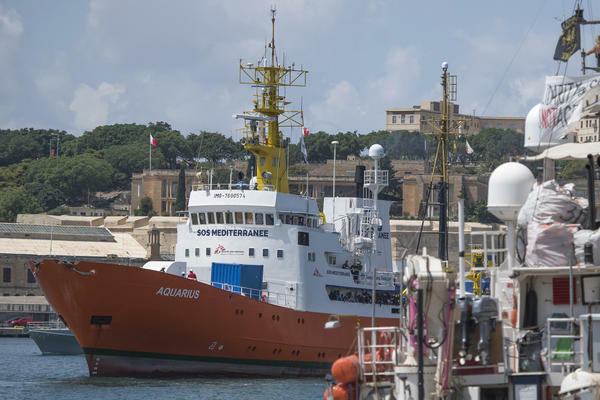 The organizations, SOS Mediterranee and Médecins Sans Frontières, said in a statement that the Panama Maritime Authority "has been forced to revoke the registration of the search and rescue ship Aquarius, under blatant economic and political pressure from the Italian government." The ship has been rescuing migrants as they made their way along a deadly and treacherous route between Libya and Europe. According to The Associated Press, "Panama's maritime authority said in a statement that it has begun procedures to remove the registration of Aquarius 2 after Italy complained the boat's captain failed to follow orders." The Italian government has denied pressuring Panama. In a tweet, hard-line Italian Interior Minister Matteo Salvini said he didn't even know Panama's area code. The aid organizations said Panamanian authorities sent them a letter stating that "unfortunately, it is necessary that [the ship] be excluded from our registry, because it implies a political problem against the Panamanian government and the Panamanian fleet that arrive to European port." In order to continue its life-saving mission, the Aquarius 2 must now find another country where it can register. The organizations say they are asking European governments to issue them a new flag. They say the ship "meets all maritime standards and is in full compliance with rigorous technical specifications as required under the Panama flag." According to International Organization for Migration, more than 96,000 migrants have arrived in Europe in 2018, most of them via dangerous sea routes. More than 1,700 migrants died or are missing, the IOM says. The Aquarius has come under increasing pressure. It had been registered in Gibraltar — but according to The Guardian, "last month it spent 19 days docked in the French port of Marseille after Gibraltar revoked its flag." And its time under Panama's flag has been short-lived. The ship is now on its way back to Marseille, and the charities say it has 58 rescued people on board. "We make a solemn and official request to the French authorities that they authorize, for humanitarian reasons, to disembark in France the persons who are on board," SOS Mediterranee Director of Operations Frédéric Penard said during a Monday press conference. "This is the only option." The ship's relationship with Italy soured in June when Salvini "ordered a block on docking rights" when the ship was carrying more than 600 migrants, as NPR's Sylvia Poggioli reported. He said at the time that "if anyone in the EU thinks Italy should keep being a landing point and refugee camp, they have misunderstood." Since then, Salvini has doubled down on his anti-immigration position. The charities stress that international maritime law requires them to disembark people in a place that is safe. "The U.N. refugee agency says largely lawless Libya, bloodied by a recent surge in fighting among militias, isn't a safe harbor," the AP reports. "Migrants returned there are brought back to detention centers, where food is scarce and beatings and sexual assault are common."